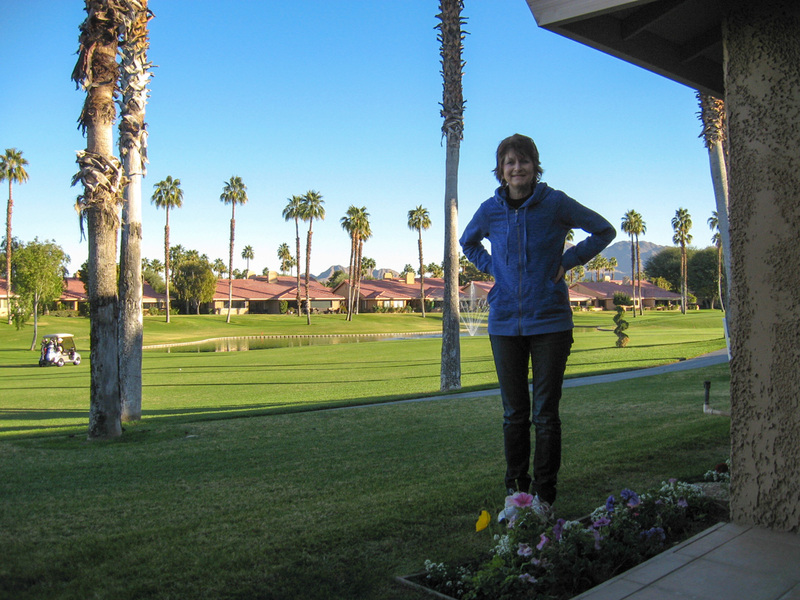 We’re “living it up in the Hotel California” — three months in beautiful Palm Desert. Although the alarm was set for 5am, we woke up shortly after 4 and got up. Thought we’d get an early start. Wasted half an hour fighting with the coffee maker. Packed everything up, turned off the heat and water, unplugged everything, and hit the road. Quick stop at Husky Gas to fill up the van tires. Too dark to see. Hit the road. Crossed the border with hardly a hello — the guy asked us where too and how much money and waved us through. Passed through Grand Forks — still too early for breakfast or for a Walmart phone purchase. Got to Fargo around 10. Gas and Egg McMuffin and cinnamon bun. No Walmart here. We left home at around 5am, headed south all the way to North Platte, Nebraska. The weather was cold but no storm. 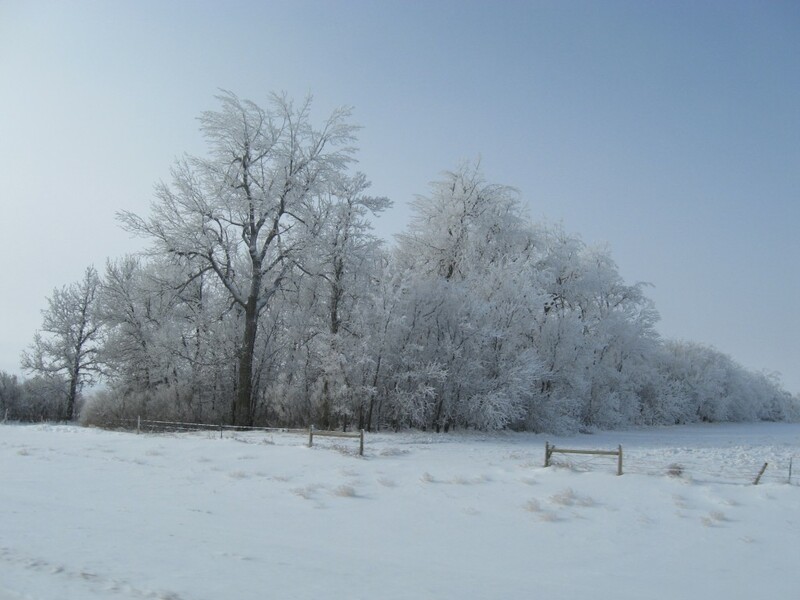 All along the I-29 going south through the Dakotas we had beautiful winter scenery like this. At Watertown, SD, we stopped at the Walmart and bought our first TracFone. Got a Palm Desert phone number (which turned out to be a mistake — phone won’t activate until we’re in that area code!). Wasted about an hour. Stopped at McDs for lunch, then back on the road. Slowly the -18C climbed as we headed west from Sioux Falls. Roads were good. Scenery continued to be amazing — hoarfrost on the trees all the way. Less and less snow as we continued southwest. Sue drove the last nearly 600kms, about half of it in the dark as the winter sun set at around 5. We enjoyed listening to NPR’s Prairie Home Companion for an hour in the dark. A gorgeous yellow full moon rose in the east as we pulled into North Platte, Nebraska. Quick stop at Little Caesars for a pizza, the bottle shop for wine and beer, the gas station to refuel, and then to La Quinta. Supper at 8.30. Found out the TracFone won’t activate here. Sue called Alex. All is good. Sue was asleep by shortly after 10. I wrote my journal and then joined her. We need to get up early tomorrow so we can make it to our next stop before the final regular season NFL games begin at 11am local time. Last night was rough — I think I ate too much pizza too late before going to bed. Slept poorly. We woke up before the 6:00 am alarm. Showered and had some yoghurt and fruit and coffee and off we were. Dark outside. Heading west on I-80 towards Denver. 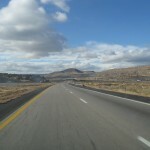 We veered south before Denver and drove for a few hours on a very lonely 2-lane, passing miles and miles of windmills. Got to Colorado Springs by about 10:30 mountain time. We gained an hour today. Checked into the La Quinta and then headed across the street to the Buffalo Wild Wings to watch football. My Giants easily blew away the Eagles, but as it turned out it was all for nought. Missed the playoffs. A short driving day from North Platte to Colorado Springs. We arrived in time to watch the NY Giants win their game but miss the playoffs. 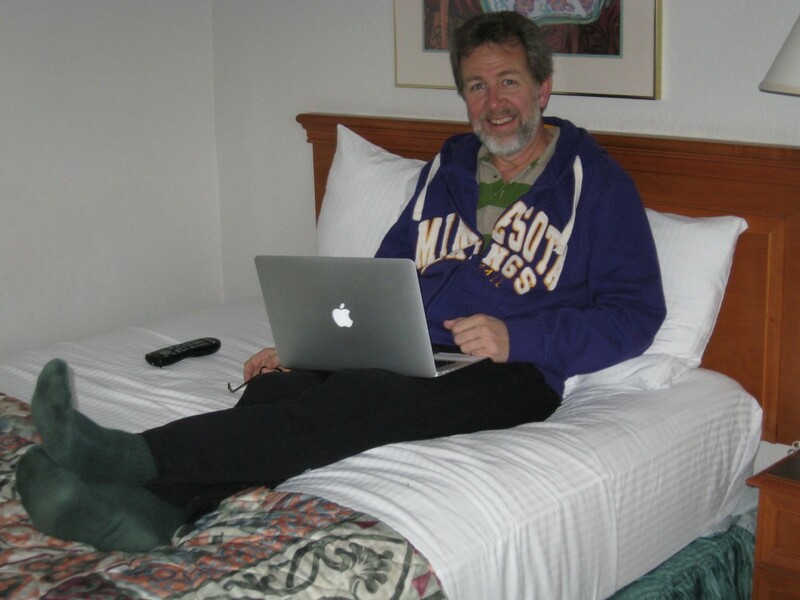 Then back to our room at the La Quinta, where I cheered on the Vikings as they defeated the Green Bay Packers, thereby assuring a playoff berth — next week the same two teams will face each other in the first playoff game. We went back to the room and perched ourselves on our respective beds and watched the Green Bay / Minnesota game. That turned out great, as the Vikings, led by Adrian Peterson, earned a rematch against the Packers next week in the first playoff game. Sue called Garth on Skype. We decided to book a different hotel in Phoenix tomorrow — we’re tired of these ‘pet-friendly’ La Quintas. We have another 12 hour drive tomorrow, hope the snow in the forecast is light and doesn’t result in road conditions like we had here 2 years ago on our way down. 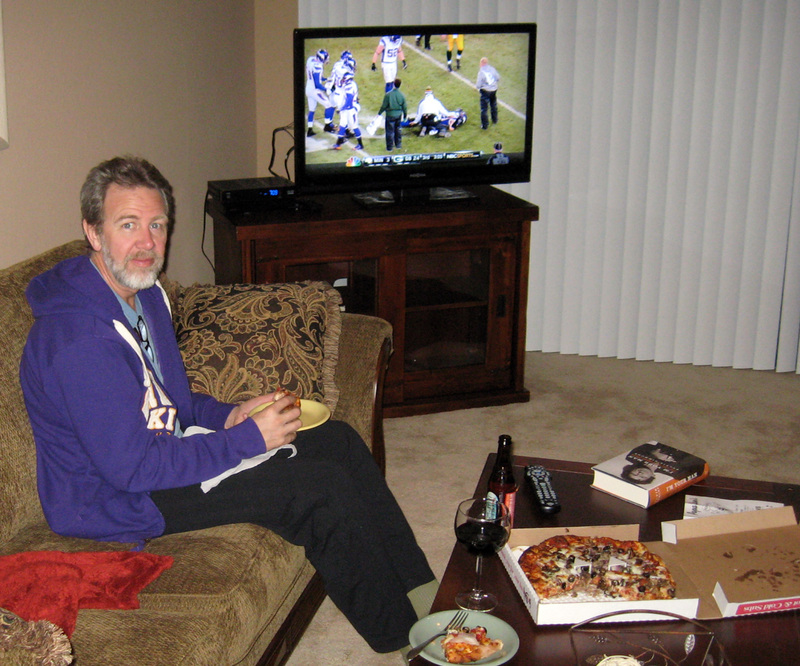 We continued watching football in the evening — Dallas in Washington — winner is in the playoffs. Now we’re on an adventure! A very interesting day today. We woke up real early, grabbed coffees to go from the La Quinta (Colorado Springs) breakfast offerings, and left in the dark. Filled up gas and hit the road. 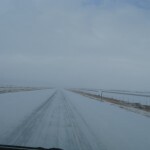 I was a bit worried about the snow that had been forecast, but the roads for the first hour were dry and clear. The road out of Colorado Springs was okay when we first set out, but by mid-morning blowing snow was making the drive a bit challenging. Soon the highway was nothing more than a set of tracks leading off into the distance. An occasional snow plough was cleaning the oncoming lane, but our lane was snow-covered and treacherous. Eventually the warmer temperatures and the salt and sand on the road melted some of the snow and made the drive less scary if somewhat messy. 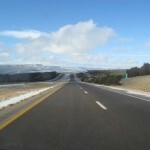 By mid-afternoon the highways were clear and the road out of Albuquerque was as scenic as we remembered it. Blue skies and red rockie ranges. But the good road conditions did not last. 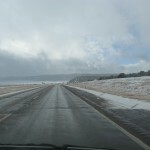 We turned south at Holbrook, AZ and had several hours of wet and snow mountain driving around Payson. Then it got interesting. Snow began falling and a few miles on it was getting tough to pass some of the more cautious drivers because of accumulated snow on the road. One lane for driving. Then worse! No lanes for driving! Roads were snow covered. I was glad we weren’t driving in the dark It was hard to see the road. Stopped in Albuquerque, NM for lunch and gas. Found a McDonalds. Ordered a Big Mac for me and sundae for Sue. Great. After our quick lunch stop we left and drove to the gas station next door to fill up. Sue was going to wash the windows. I had to go in and leave my drivers as security — no zip code for my credit card so it doesn’t really work here. As I got out of the van to fill up, Sue discovered that her purse was missing. She’d forgotten it at McDonald’s! She ran across the driveway to see if it was still there. I filled up the van. I knew when she came back that it was gone. What was in the purse? About $300 cash, all her credit cards, our passports, etc. Hmmm.. Not good. 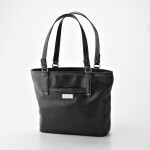 Sue went back into the restaurant to ask the staff and patrons if anyone had seen who had taken her purse. After I finished filling the van I drove it to the McDonald’s parking lot. We decided to Skype/phone the credit card companies and report the stolen cards. Did that. Then the McDonald’s manager suggested we report this to police. We did that. Were told it could be hours until police would check this out, but we should wait around. In the meantime, Sue again went in and quizzed the patrons. Nothing. The manager suggested that we check the surveillance video. And there he was — caught on tape, clear as day. Not the guy Sue suspected, but a young guy whom Sue had questioned and had even looked into his backpack. Then the policeman arrived. We completed a report. He looked at the tape. Yep, clear as day! He would drive around looking for the guy. Maybe the purse had been dropped into a dumpster around here. We left our contact info with the cop, wished him a happy new year, and then, after about a 2 hour delay, got back into the van and continued on our way. No, Sue wouldn’t be driving — no driver’s license. The road into Arizona was pretty good. We turned south at Holbrook and stopped for supper (tacos). Continued on until Heber, where we refueled. The road was surprisingly windy and wet. LOTS of snow. Now that we were in darkness, driving took full concentration. Windshield constantly splashed by cars ahead. While the bad road conditons and the incident at the Albuquerque McDonald’s put a big damper on the day, THIS was a pleasant surprise when we arrived at our hotel in Phoenix at around 8pm. Finally at 8:30pm we arrived at the Hampton Inn near the Sky Harbour Airport in Phoenix. 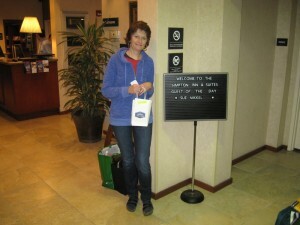 And as we went in to check-in, Sue was informed that she was the lucky ‘Guest of the Day’. We got upgraded to a suite! Sweet! 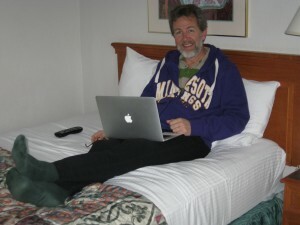 We got into our room, checked our emails (nope, no ‘good’ news from the nice Albuquerque policeman). Had some snacks, Sue had some wine and I a couple of beers (New Year’s party! ), and after a bit of computing, we went to bed. Tomorrow we will begin our day by calling the passport office, our TracFone contact to get the international calling set up, etc. Then we’ll take the four-hour drive to Palm Desert. Home real soon. Woke up in our lovely hotel suite. Had a lazy start. No rush today; we’ve only got four hours of driving and then we’re ‘home’. Went down for a big waffle with peanut butter. Another coffee. Back in the room I did my best to argue with some ‘Pete’ in the Philippines about my TracFone — and was told that no, they no longer offered the ‘friends and neighbours’ option for Canadians. Was on hold for over an hour, with TERRIBLE music playing way louder than the occasional operator announcement. Finally gave up in frustration. I was really pissed off. Shortly after 11 we hit the road. Sun was shining. People in short sleeves. Got into California. Stopped at a little car wash and washed the van. Drove a bit more. Surprising how much traffic there was on the road today — lots of motorhomes, lots of semis. Busy roads. Temperature around 11 degrees — but it’s supposed to warm up in the next few days. Got to Indio, not far from our Palm Desert destination. Went to a Jack-in-the-Box for lunch. Big casino here. Kind of depressing. Had a bad feeling about where we were going — maybe we should have booked something in Phoenix instead, where everything was safe and clean? Filled up the van one last time. Our rental was effective at 3:00 pm — we would arrive shortly after that. Turned off the #10 highway into Palm Desert. Everything is green. Clean. Developed. Neat and tidy. Okay, maybe this will work out okay. Went through our Country Club entry gate — told them we would be renting for the next 2 months and they let us in. Found our house. Went in. Pretty nice. I think it’s better than what we expected. Lots of open space. Big rooms. Lots of light. Everything is new — never been used before. We unloaded the van. Carried everything in from the garage. I’ll put the bikes together another time. Golf clubs need to be sorted and put in the bags. Not so sure about golfing our course — we watched one old guy hit 3 balls off the tee, and one nearly hit us on our patio! i think it is a very tough course. Are you serious? I called. Left a message. We got into the van and went for a ride, shopping for groceries at the Albertsons on Hwy 111. Took us two hours and this is just to tide us over for the next day or two. It gets dark really early here. At 5pm it was pitch black outside. Drove around the area a bit. LOTS of shopping here. Quite nice. Quite different from Arizona — green and developed and we are more like right in the middle of a city — not as remote. There will be good and bad things about that. Sue reading the email from the policeman in Albuquerque — they’ve found her purse! We came back to our house and I called the number again. The officer answers. Yes, he has our purse. No cash, but EVERYTHING ELSE is in there! Unbelievable. We arrange to have him Fedex it to us here. Amazing. We sit in the living room and can’t stop discussing this turn of events. Quite the way to start off the holiday. Quite a way to start off the new year. We watch a little news on TV. The furnace is making the place nice and warm, just what Sue wanted. The furniture is very nice and comfy. We skype the kids. We eat our faspa. We have a celebratory beverage or two. It’s a great day. I unbox my computer and we move a little table from one of the guest bedrooms into the living room. I put my old office chair together and set up. It works. Everything works. Well, not that dang TracFone. But now we’ll leave that for another day. We realized that we had no coffee filters in our house last night, so buying that nice coffee wasn’t really going to help us this morning. So, after a quick cup of instant coffee, we went out into the bright California sunshine. We walked the nearly half a mile OUT of our country club development, and turned south along Portola Avenue, headed for the El Paseo shopping street of Palm Desert. It turned into a pretty long walk. We ended up next to the Visitor’s Center and had breakfast at a Starbucks there. Lots of people out and about. An interesting corner to sit at and watch people. After a quick stop at the Visitor’s Center continued our slow walk along this major shopping alley. Stopped in at the Apple store to see if they had any iPad minis in stock — only black ones — we’ll wait for the white ones to arrive. Sue priced out some haircuts — $400? Maybe not. We came back up along Monterrey Avenue, past the big Westfield Mall. We even tried to talk security at the Monterrey Country Club into letting us take a shortcut through their development back to our place — nope, no way, and besides, there’s a big wall in between. So we walked ALL the way around. Got back at around 1, time for lunch. Hot and tired. We’d walked more than 12 kms, more than I’m used to walking lately. After showers and lunch and some relaxing, we went for a ride, scouting out some of the big box stores. We went to a Walmart where I stood in line forever waiting for the TracFone guy to help me (he tried, but when I got home it still wasn’t working to call to Canada). We even went to Costco where Sue bought bacon and steaks to last us for a few weeks. Back at our house after dark again, although ‘dark’ happens here at 5pm. Couldn’t really watch the Redbox DVD I’d rented because we don’t have the RGB cables to hook up our new DVD player. Oh well, another day. We had a late supper (roasted potatoes and chicken) and watch a couple of ‘restaurant makeover’ shows on TV. Went to bed early. Tired. The end of a ‘very busy’ day! Woke up early, before dawn. Sue made coffee, a first with our coffee maker. We watched the sun come up on the 13th fairway, just outside our window. Bacon and eggs for breakfast. I skyped with Koop and started working on a project for him. I think I finally figured out how to use our TracFone to make local and international calls. I’m not sure I’ve got Google Voice connecting to it, but we did finally receive and make calls. Alex called on FaceTime so we could visit with Max. Ingrid called (hi Ingrid). 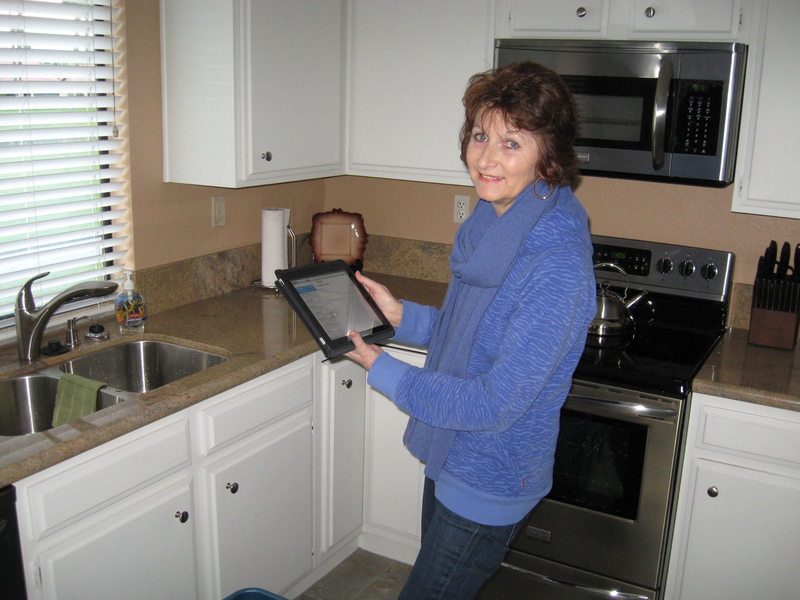 Linda, the property owner, also called. Sue did a few loads of laundry, since none of the towels have been washed (they’re all new) and won’t dry properly until they’re washed. We had sandwiches for lunch. Sue sat on the patio and did her nails and chatted with the ladies who were golfing today. We barbecued steak for supper. Then Sue read, and we watched a bit of TV before bed. Got up this morning feeling like my inner clock was adjusted to Pacific Time. We had coffee and sat around in the living room for a while, reading our emails and news and stuff. Sue had a big shopping list going. I went into the garage and worked on putting our bikes together — and once that was done I took a spin around the neighbourhood. It’s cool in the morning and most walkers have jackets or sweaters on. I cycled over to the driving range, which is down in the creek bed next to our place. $10 for all you care to hit all day. Hmmmm.. not bad. That’s probably what we should do before we venture out on the course, especially our course, where the fairways are so narrow and lined with breakable windows on either side! We took the van back up to the big Walmart up on Monterey and bought some plates and kitchen things. Then down to Albertsons for to buy some groceries. And then down to Trader Joes for even more groceries. It was 12:30 by the time we were home — high time for lunch (soup and sandwiches). After lunch I played with our Google phone system again. I cancelled my phone number and signed Sue up for one (same BABYMAX number, but with a different area code at the front of it). Tried it. I think it works, finally. Then we went out for a walk around our community. A long walk. Sun was out, and although it started out as jacket weather by the time we were half way around we were carrying our jackets. We stopped at the Country Club office — to register and ask about golf memberships and so on. We’ll probably try golfing here once in a while, but we hope to find a golf course nearby that’s more our speed: less challenging and more open to ‘walkers’ who are just learning to play. Sue in our back yard. When we got back to our place it was time for happy hour. 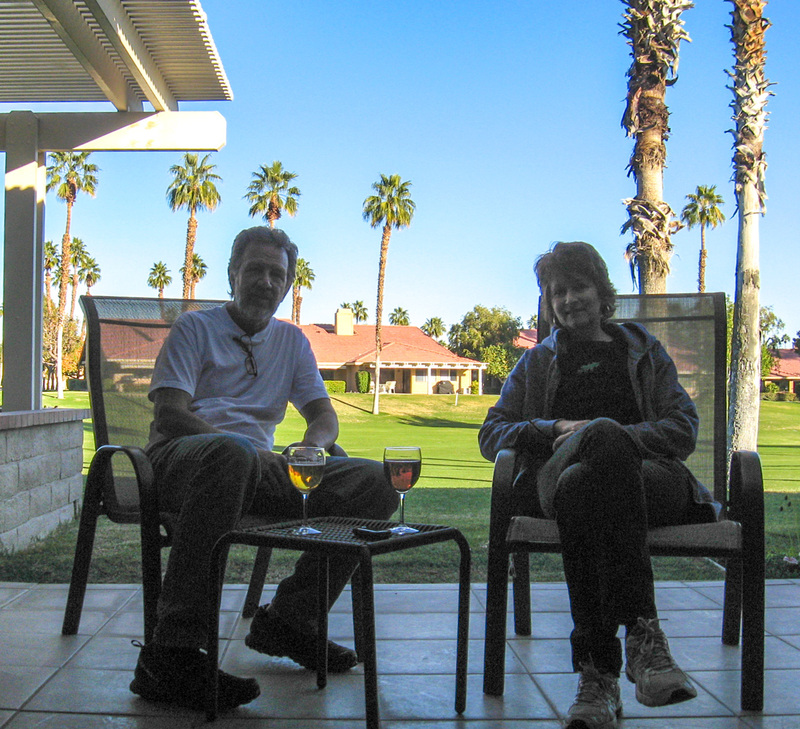 Out on our back patio, watching all the golfers go by, sun setting on the Santa Rosa Mountains. Sue phoned with her sister Mary and brother Dave. Then we had supper and headed out to the Westfield Mall Cinema for a 7pm movie: Argo. A pretty good movie. We hurried home to watch the 2-hour Paul Simon’s Graceland special on PBS. A good way to end the day. Saturday morning. Woke up early again. The good thing is that the sun comes up early too, and we get some nice sunshine in our kitchen and dining room. We read our emails and stuff, and then Sue made bacon and eggs. Great. Sue did her morning exercises. I ordered that white iPad mini for Sue online — it’ll only arrive here in 2 weeks or so. Tim and Alex and Max skyped us — updates on THEIR passport problems, etc. At around 11 we got on our bikes to go for a ride. Just as we left our driveway the Fedex truck pulled up. Here comes our package. 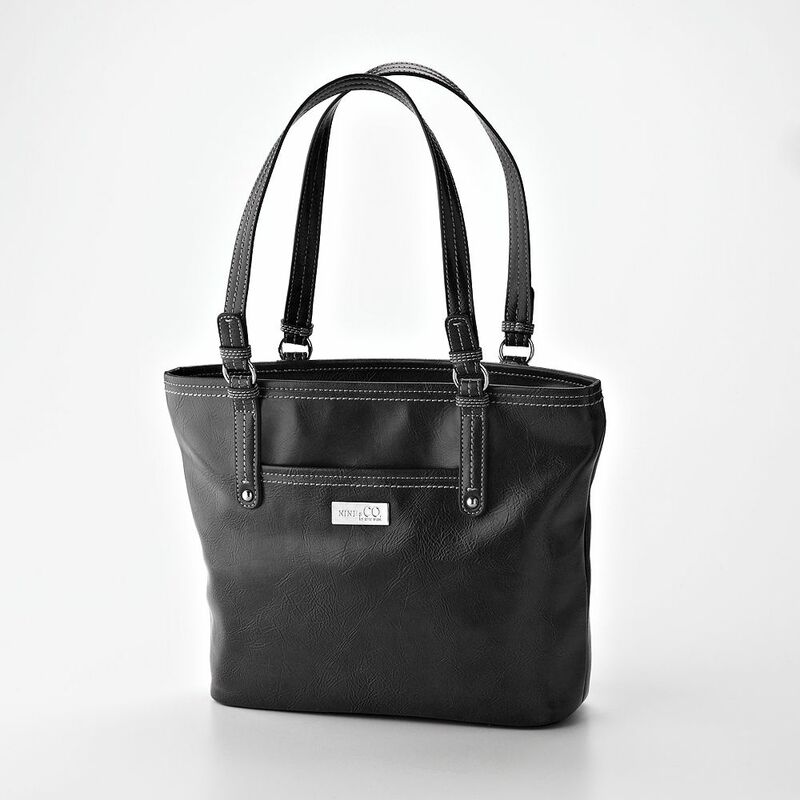 I took it inside, opened it just to make sure — yep, it’s Sue’s purse and contents, arrived from Albuquerque. Locked the door behind me and got back on the bike. We cycled north out of our complex, and up to Country Club Drive. Stopped at the Bristol Farms grocery store — kind of like Trader Joe’s but more ‘organic’. Nice. We noodled around the mall parking lots at the Monterey corner, then meandered our way back to our place. We checked out some of the small bays on the way. Once we got back inside our gate, Sue checked out an Open House — nice home, bigger than ours, well-appointed, $269,000. We tried to buy a local paper from the newstand near the clubhouse but it didn’t work. Oh well, we try again another day — want to check out the ads for local golf courses. Back at our house, we watched the golfers in our backyard while we had lunch. Then at 1:00 it was time to tune in to the first NFL wildcard game of the season. I watched the Texans defeat the Bengals while Sue wrote an email to the Albuquerque constable to let him know we had our purse back and to thank him. At 5pm the game between the Vikings and Packers began. It was getting dark outside, and I could see TVs in some of the surrounding homes also tuned into the game. Sue ordered in pizza from Papa Don’s (we’d picked up a menu there on our morning bike ride). 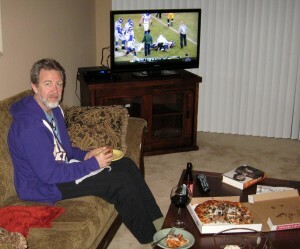 The pizza arrived a little after 7, by which time the Packers had the game under control. Tomorrow we have 2 more games, starting at 10 in the morning! Ah, these are great weekends! Oops, forgot to write in my journal — so this is being written on Monday. Woke up and watched a couple of our favorite Sunday Morning News shows — Fareed on CNN and Reliable Sources. Then at 10 it was time to focus on football again. First game up: the Colts in Baltimore. Pretty good side story here — Ray Lewis’s announced retirement made this his last home game. I was cheering for the Colts, but in the end they lost 24-9. Oh well, so far this wildcard weekend has left me at 0 for 3. Next game, starting at 1:30, featured the Seahawks in Washington. RG3 was playing hurt, and that was a big reason why the Seahawks won 24-14. Finally I had picked the right side to cheer for! Sue and I went for a quick walk around our community — along the golf cart path — just as the sun was setting. In fact, by the time we got home it was dark. We had leftover pizza for supper. I had been working on the SteinbachApartments website during the morning game, and finally made a bit of headway. Still not quite there, but I’m getting close. That’s encouraging. Alex and Tim skyped — Alex was sick and feeling poorly, and that made us feel bad for her. Sue went to bed early. I worked on the computer for a few extra hours, then went to bed too. No photo today — we should have taken the camera along on our walk, but we didn’t. Oh well, maybe tomorrow. Got up just before the alarm went off (at 7am). We had our morning toast and then Sue did some laundry while I continued to work on my website. We thought about going to our driving range, but it closes at 10 on Monday, so we’ll probably go tomorrow. Skyped with Koop about some computer work at lunch time — just before we hopped into the van to go to Cathedral City — to the ‘cheap’ theatre for a movie. The movie, “Cloud Atlas”, began at 12:15. We got there just in time. The movie was almost 3 hours of drivel — really not at all interesting and nothing to say. But at least it was cheap! $1.25 each! After the movie we headed back towards home. Stopped at Costco to see if they had any good restaurant cards for sale — thought maybe we would buy that for our friendly Albuquerque cop to say thanks. Sue was ready to go ahead with it but I argued that cash would be a way better gift. Sue gave in, although not willingly, and we left without buying anything. On the way out of there we passed a post office store. We quickly made a stop and sent a quick note and cash to the Albuquerque address. So at least that little deed is done and taken care of. Got home and had to hurry out the back to go for our walk. Just like last night, we started a bit too late. It gets dark so early here that you pretty much have to start the walk at 3:30 or you won’t finish it in daylight. Gives a whole new meaning to ‘twilight golf’ too. Back at the house Sue got the shrimp and broccoli going while I took a look at a college football game on TV. Then Alex and Max skyped — they’re off to get passports tomorrow. All good at home. That means all is good here too. We watched an Oliver North ‘anti-Bush’ documentary on Showtime on TV. I continued to make progress on my WordPress theme project on the computer.